1 For SUMMER ROLLS, combine Hellmann’s® Organic™ Mayonnaise with ginger in small bowl. Heat 2 Tbsp (30 mL). Mayonnaise mixture in large nonstick skillet over medium-high heat and cook shrimp, turning once, until shrimp turn pink, about 3 minutes. Remove shrimp; cool, then coarsely chop and set aside. 2 Combine noodles with remaining Mayonnaise mixture in bowl*. Combine cucumbers, cilantro, carrots and green onions in another bowl. 3 Fill large bowl with water. Working with 1 wrapper at a time, soak in water until pliable but not limp, about 30 seconds. Lift wrapper out of water and let excess water drip off; transfer to cutting board. 4 Arrange some of the shrimp on lower third of wrapper; top with about 1/4 cup (60 mL) each noodles and vegetables. Fold bottom of wrapper over filling, then fold in ends and roll up like a burrito. Transfer to platter. Repeat to make 11 more rolls. Cover rolls with damp paper towels, then cover with plastic wrap. Refrigerate until serving. (Can be made 1 day ahead). 5 For DIPPING SAUCE, combine remaining ingredients in small bowl**. 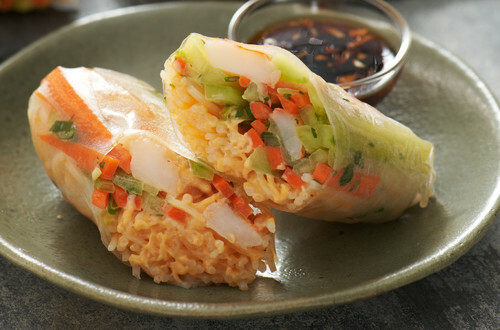 Cut summer rolls in half and serve with Dipping Sauce.